Today is the 67th anniversary of Grant Wood's death; tomorrow is the 118th anniversary of his birth. At the request of readers Meredith T. and gmsc, today's "Feel Art Again" features "the only artist in Iowa with an international reputation," who died just one day shy of his 51st birthday. 1. Grant Wood's most famous painting, "American Gothic," was first exhibited in 1930, catapulting the artist to instant fame. He became known as one of the most eligible bachelors in his hometown of Cedar Rapids until 1935, when he married Sarah Maxon. Wood's marriage to the actress and opera singer, which his family and friends had been against from the start, was tumultuous, resulting in a divorce just 4 years later. 2. While "American Gothic" may look like a simple painting, it has spurred debate and inspired strong emotions ever since its first exhibition. Some people, most notably Gertrude Stein, viewed the painting as a satire; Iowans were upset to be shown as "pinched, grim-faced, puritanical Bible-thumpers. " The painting so upset Iowans, especially farmers, that one farmwife threatened to bite off Wood's ear and another informed him that he should have his "head bashed in. " Later, though, the painting became accepted as a "depiction of steadfast American pioneer spirit. " Wood himself insisted that he was a "loyal Iowan" and that the painting was not meant to be a derogatory representation of Iowan farmers, but just a depiction of generic small-town Americans. 3. During World War I, Wood served the country in Washington, D.C., where he put his artistic skills to use making clay models of field gun positions and painting camouflage on artillery pieces. Other jobs in his pre-fame days included teaching in a one-room school house and a high school, working in a silversmith shop, and decorating house interiors. 4. In addition to producing many works of his own, Wood also fostered the artistic talents of others. He co-founded the Stone City Art Colony in 1932 with the aim of helping artists survive the Great Depression. Housed in a large mansion, the colony lasted just 2 summers but included some 80 artists. As a Works Progress Administration director around the same time, Wood was in charge of the 34 artists working at the University of Iowa, overseeing a significant outpouring of artwork. 5. "American Gothic" may be Wood's most famous work, but he was certainly no one-hit wonder. He enjoyed a successful career—in fact, he was so well-respected that he was commissioned for a stained-glass window for the Cedar Rapids City Hall even though he had never worked in stained-glass before. He traveled all the way to Munich, Germany, to learn stained-glass techniques. 6. One of Wood's works is depicted on the Iowa State Quarter, which debuted in 2004. 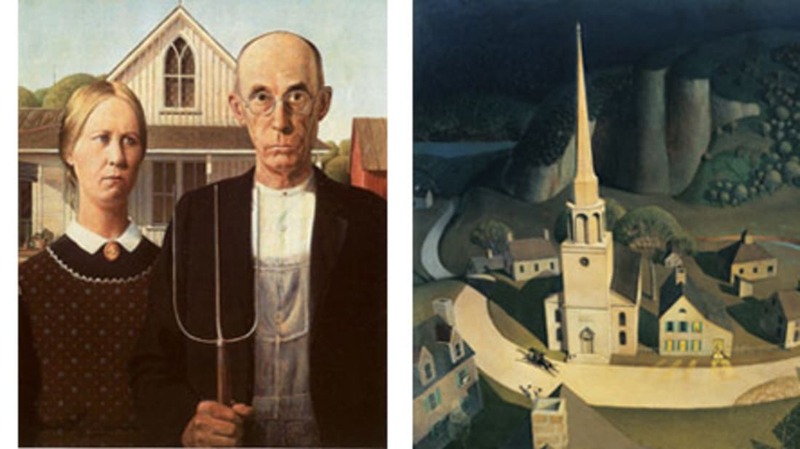 Larger versions of "American Gothic" (above left) and "The Midnight Ride of Paul Revere" (above right) are available. Fans should check out the American Gothic House Center; the interactive Grant Wood's Studio; the World of Grant Wood; the Grant Wood Art Gallery and CRMA's Grant Wood collection; the collection of Wood's work on Museum Syndicate; the Grant Wood papers at the Smithsonian; this coloring page version of "American Gothic"; the Grant Wood Scenic Byway; and Devorah Sperber's "After Grant Wood (American Gothic) 2". "Feel Art Again" appears every Tuesday, Thursday, and Saturday. You can e-mail us at feelartagain@gmail.com with details of current exhibitions, for sources or further reading, or to suggest artists.